One day the CompostMaster announced he was going to make lunch. I expected to get several leftovers morphed into something new, but he really upped his game by making Shrimp Salad Stuffed Avocado. You’ll need cooked shrimp, so you can use leftover peel & eat shrimp, buy it pre-cooked, boil it with some Old Bay seasoning and apple cider vinegar, or roast it like Ina Garten suggests. Just make sure the shrimp has cooled completely before you proceed with the recipe. Mayonnaise rarely excites me these days, but I loved this take on shrimp salad. We had gotten a free jar of avocado oil mayo and it was perfect in the dressing. We’ve also made it with plain Greek yogurt and I’m sure regular mayo would work fine too. I think the CompostMaster should make lunch more often. In a medium bowl, combine mayonnaise, vinegar, parsley, ginger, and scallions. Mix well. Add shrimp to dressing mixture and season with salt and pepper. Slice avocado in half lengthwise and remove pit, but do not peel. 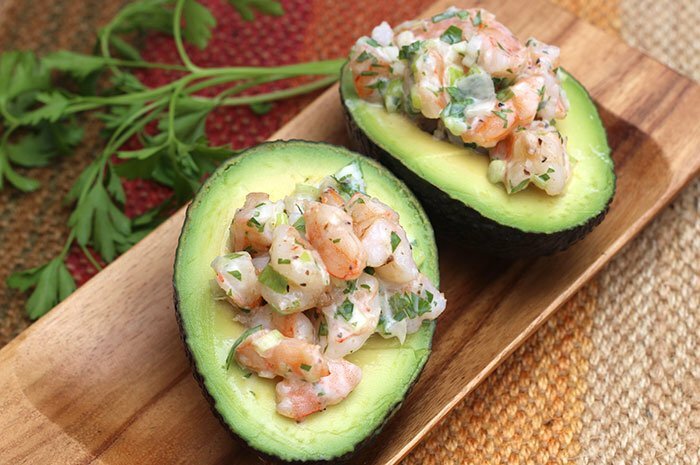 Spoon shrimp salad into avocado halves. Squeeze a wedge of lime over each avocado and serve immediately. Eat with a spoon. Make-ahead tip: Mix up shrimp salad (complete recipe through step 2) and refrigerate. Just before serving, slice avocado and complete recipe. Does Diabetes Contribute to Alzheimer’s? I am obsessed with avocados, this is fabulous! Mary – I am too!